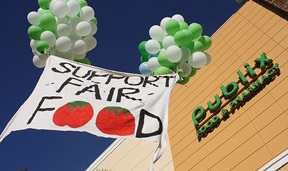 … this time, the balloons were there to make consumers think, not just react — to think about the people who pick the food they eat and the poverty behind the Publix produce aisle. 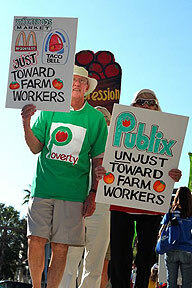 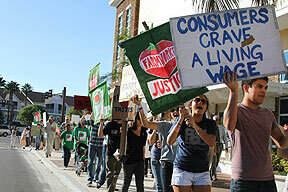 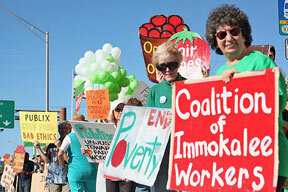 … all with a simple message, one they have been calling on Publix to support for two years now: A penny more per pound. 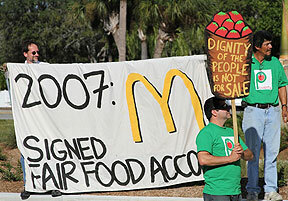 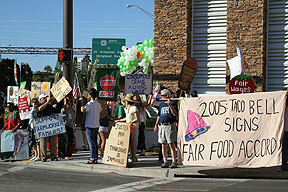 … and a Taco Bell restaurant on the other, the protesters were sure to remind the thousands of motorists and consumers who came across the demonstration that those two fast-food companies had long-ago signed Fair Food agreements, while Publix — Florida’s own grocer and so far closer to Florida’s shameful history of farmworker exploitation than the Illinois- and California-based companies — remains stubbornly opposed to the first real hope for farm labor justice in the history of the state. 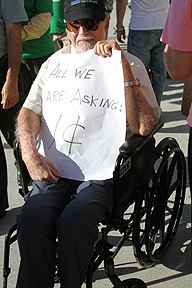 … that kept the protesters’ feet moving and their spirits high. 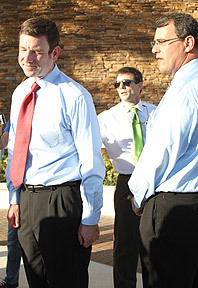 … bringing their own special sparkle to the event. 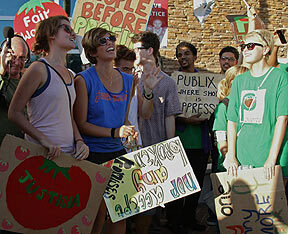 But even their best efforts could not dampen the spirits of the allies gathered in Sarasota on this day. 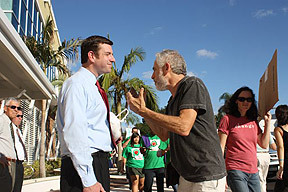 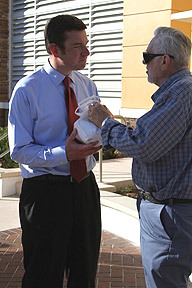 Here, a Charlotte County Fair Food activist hands over a bag full of receipts to a Publix employee as a concrete representation of the purchases he and his friends in Charlotte County, south of Sarasota, will no longer make at Publix if the company continues to shun the Fair Food Program. 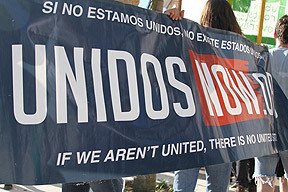 Other allies came out in force for the afternoon protest, including Unidos Now, the Sarasota-based immigrant rights organization that is giving immigrants throughout Florida a voice both in local communities and in Tallahassee. 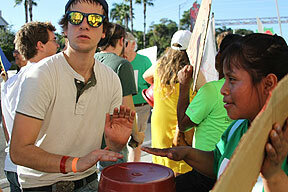 … adding their own youthful brand of energy to the protest mix. 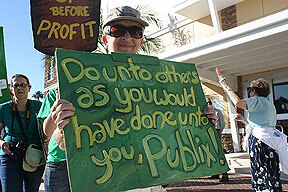 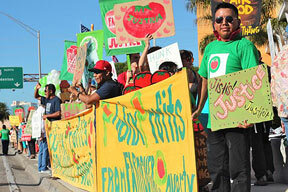 … some with a home-made message that couldn’t be missed by those Publix representatives on hand! 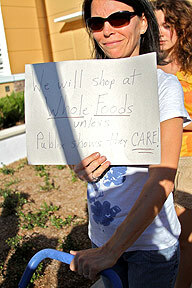 This one — “We will shop at Whole Foods until Publix shows they care” — points to an alternative more and more Sarasota residents are electing, a grocery situated a fraction of a mile away from the new Publix that actually has taken an ethical stand in its tomato purchases. 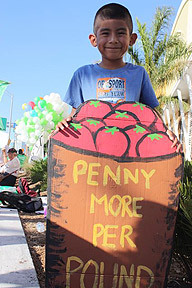 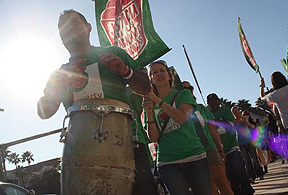 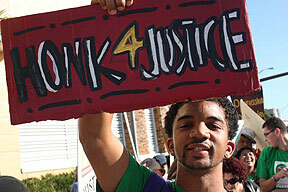 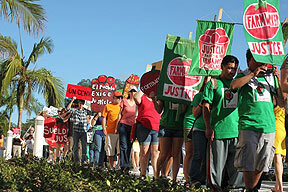 … a message that, through all the fog of confusion and double talk out of Publix corporate headquarters in Lakeland, still comes down to this: A penny more per pound to support a measure of economic justice for workers who have know nothing but exploitation for generations.